It was so weird, because I decided that I will directly practice on this quilt and boy that Long Arm machine had its own plan for the quilting. My designs oriented to be most straight....curves were all gone until after an hour or so. 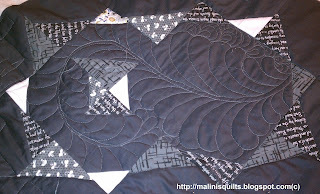 Hmmm....well I didn't get to finish the quilting for before our BMQG Feb16th deadline for Madrona Road Challenge and now I am finishing up this on my DSM. You can see my curves are looking much better. I think I have the feather bug again and going to quilt different feathers in the block centers and then keep the quilting simple on the triangles with just simple curves and SID. 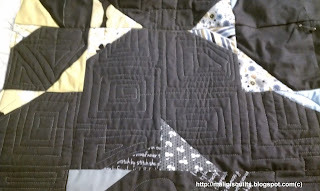 Now linking it up with Leah Day's FMQ Fridays. Good Job on your quilting. I like how you changed stitching patterns for the different areas. very interesting quilt. You do a lovely job. Thanks for sharing. I don't understand the Letters?????? Can you explain? Love your big flower and your feathers. Wow! 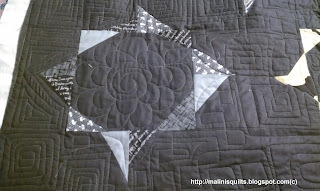 What beautiful quilting Malini! 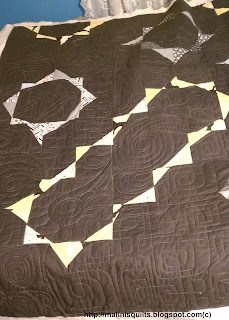 I'm so glad you were able to quilt a bit on a longarm. I have played with a few different models, and certainly admire their speed and ease of use. Let us know how it goes to quilt part way on a longarm and finish up on a DSM.